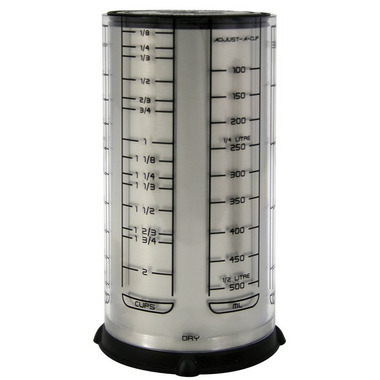 KitchenArt Pro 2 Cup Adjust-A-Cup measures metric or standard for liquids, dry and semi-solid ingredients. Itâ€™s very light and I do like the measuring features. I used it for the first time and really liked it. Saw Christopher Kimball of PBSs America's Test Kitchen demo this product on an episode of Rachel Ray. Thought it was unique and cool, searched online, found it on well.ca and bought it (actually bought the 2 cup, 1 cup and mini). Works as designed, real cool, recommend it for those people that are tired of bending over their kitchen counter to view the side of a regular measuring cup to see if they have the correct amount.